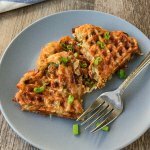 Packed with delicious flavor and wonderfully cheesy, these waffle iron hash browns are sure to be a hit at breakfast! They are deliciously crispy on the outside and creamy on the inside. 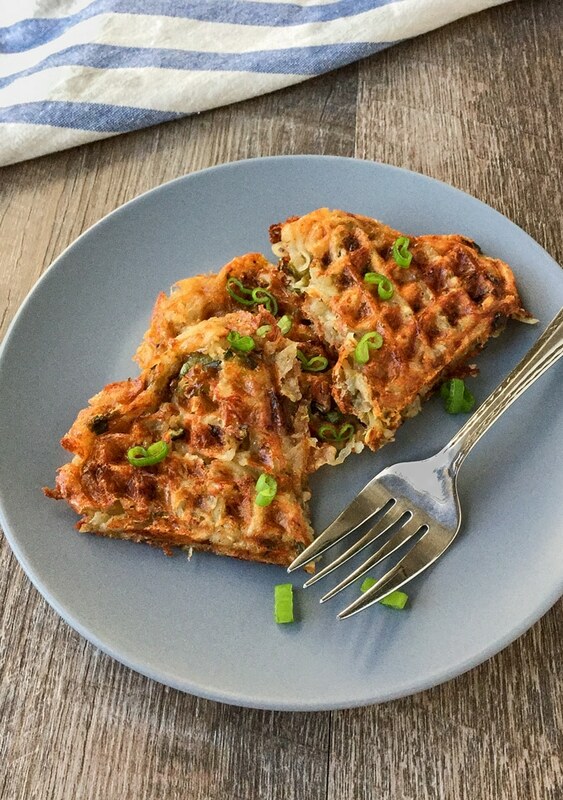 You guys, these hash brown waffles are so unbelievably good! First of all, a waffle maker is one of the best ways to get hash browns crispy on the outside and creamy on the inside. If you haven’t made them this way, then get on it! I’ve already shown you how to make regular Waffle-Iron Hash Browns, and I love those.Recently though, I decided to kick it up a notch and make a new version. I thought that roasted green chiles and Monterey Jack cheese would make tasty additions to my hash browns, and I was so right. These Cheesy Hash Brown Waffles also smelled amazing while they were cooking. My husband couldn’t wait for one to be done so he could try it! In my recipe, I used my own homemade roasted green chiles, but you could use canned if you prefer. You just want to make sure to drain them super well before adding them to the potatoes. Also, squeezing all of the moisture out of the potatoes before using is a crucial step in making these hash brown waffles. I had a super large russet potato, so I used that for mine. You may need a couple of potatoes if yours are smaller. Preheat waffle iron. If your waffle iron has controls, then preheat on medium. Place the shredded potatoes in either a dish towel or paper towels and squeeze all of the moisture out. Mix the butter, potatoes, scallions, green chiles, cheese, sea salt and chili powder together until the potatoes are well combined. Spread the potato mixture onto your preheated waffle iron and close the lid. Press down gently to help compress them together. Let cook until golden brown. You can check on them after they have been cooking for a few minutes to gauge their progress. You may need a silicone or rubber spatula to help you loosen them. If you are not using a non-stick waffle maker, you should grease the grates with butter or cooking spray. Mine came out of my non-stick just fine, but you may still want to use a little butter just for extra insurance. By Tempie at June 4, 2018 .